Ramada Navi Mumbai is located in Millennium Business Park, 3.3 km from Reliance Corporate Park. It offers a fitness centre and an outdoor pool. Free WiFi is available throughout the property. Each is fitted with a flat-screen TV and tea and coffee making facilities. There is a sofa bed in each room. Laundry, dry cleaning and ironing services are available for guests’ convenience. Free parking is available. The 24-hour Coffeescape serves a variety of European, Chinese and Italian cuisine. Veg Craft specialises in vegetarian delights while Golden Jade has international dishes and a variety of drinks. The hotel is located 28 km from Chathrapathi Sivaji International Airport. When would you like to stay at Ramada Navi Mumbai ? This double room features a sofa, seating area and minibar. This double room has a seating area, minibar and air conditioning. Payment before arrival via bank transfer is required. The property will contact you after you book to provide instructions. Guests are required to show a photo identification and credit card upon check-in. Please note that all Special Requests are subject to availability and additional charges may apply. Please inform Ramada Navi Mumbai in advance of your expected arrival time. You can use the Special Requests box when booking, or contact the property directly with the contact details provided in your confirmation. 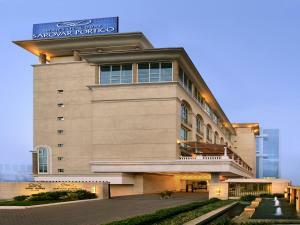 Each day we'll check prices and send you an email for your selected dates at Ramada Navi Mumbai. If you don't have specific dates but would like to check prices for say next weekend or say next month we can check the price too. Click to write a review and share your experience of Ramada Navi Mumbai with other travellers.